What is UP with Backlinks from Google, Yahoo, Bing? Murray's posts are indexed within the hour. See the notation "48 minutes ago" in this image. This information comes from the free test version of MazeCore Monitor we are currently testing. It shows our indexed links at Google and Yahoo are down -1 and -374 respectively while our links in Bing are up 4 and backlinks at Bing are up +1280! The dark blue line on the bottom is Google, the red line is Yahoo and the huge increase shown on the orange line is Bing. Does anyone else wonder why Google only counts 28 backlinks, Yahoo counts 1,647 and Bing counts 5,090? Could Bing be counting Social Networking activity? What do YOU think? MazeCore Monitor certainly looks interesting. The free version allows you to track one Web site and three keyword phrases. Great tool.I think Bing has a long way to beat Google-it’s expanding and buying new IT firms and gaining new tech guys.Facebook seems a good option to acquire next,if they can and Mark will. I think getting paid links is just worth it cause the result you will get from it will give it back to you in the future. 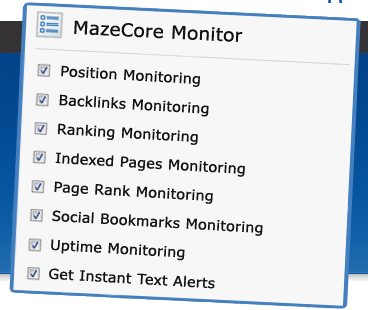 Hi great post, I was wondering whether MazeCore Monitor gives you diferent data than other website analytic tools. I have tried several and sometimes the results are different. Have you tried linkdiagnosis.com as well? Regarding the backlinks in different search engines I have think it is necessary to understand that the backlinks from the most important search engine is most relevant and it clearly needs to be understood what drives the links in that serach engine. Every tool gives different data. I have yet to ever see any of them agree. I haven’t seen linkdiagnosis.com but since I wrote this I know a lot more people are using the SEOMoz toolbar. I know that Yahoo site explorer often gives conflicting results of backlinks profiles. I have checked my own blog within an hour and the reporting is different between the two inquiries. Either way – it still isn’t bad to just get a rough idea of where you stand. Other tools are out there too! Thanks for this great post. In one of your reply, you talked about paying bloggers and website owners for their time and effort to add relevant links – I think this idea is cool…. Any idea how to do that? I would say it is likely that Bing does count social bookmarking. I recently heard that google only counts dofollow links. I am not sure how accurate that is, but they do report a less amount than the other search engines. I know nofollow links are useless, but Yahoo and Bing still report them for some reason. Do you recommend buying links or link building software? I don’t recommend either because the drawbacks to both exceed the benefits. If you publicly buy links and Google© notices that can get your site penalized and there goes your search traffic (because they have a virtual monopoly on both free organic and ppc paid search). Most link building software spams sites, usually blogs, and we just keep deleting and banning sites that use it. Then when you want to do it right it will be far more difficult because bloggers will think you’re a spammer and ignore or blacklist you. What I do recommend is using CommentLuv to build links in comments and relationships with bloggers who write about subjects related to your business. Read How CommentLuv Works and How CommentLuv Grows Businesses and Blogs in this reply. Businesses could also offer to pay for the time required for other Web site owners and bloggers to add relevant links for them to their sites. Pay for their time and effort – not links. Before you get started on building links be sure you are targeting the right keyword phrases. See my post on building traffic for tips on how to research keywords and track your results. Here’s how I see SEO across the big three search engines: Start with Google, they seem to be the most sophisticated. Read up on how to optimize your site for Google and get the ball rolling. From there, once you see results in the search rankings, give it about a month and Yahoo and Bing should follow suite and start displaying you with similar rankings. That’s just what I have noticed over the past year. Start with Google because they have a virtual monopoly on both free organic and paid ppc search – a bad situation that Internet users could improve by using alternative search engines like that link to DuckDuckGo. They have cleaner results and are independently owned. There are many others – just search for “alternative search engines” in any search engine. Some have special purposes like these niche search engines that search for specific types of content online. Our collective actions are creating monopolies that are destroying our economy. There are stats in the second half of my Word of Mouth Marketing post that explain how that happens and how we can create a stronger economy and better living standards for us all. I agree Google is still the beast and most likely always will be, BUT i always optimize my sites for other search engines. You would be a fool not to. What is the solution because Google is making my life harder! Your article is very helpful. Thank you for the information! Keep it up! I’ve never been able to figure out how I have 2000 yahoo backlinks and 12 in google… really, does that make sense? Google can be a tough cookie sometimes, don’t even want to get started down that road. We all are wondering about the big G, that’s for sure. Google is really making it hard to us. Maybe they think that they are really the one who needs to be praised to get more backlinks. If only we can do something.. Interesting fact, when I check my link in Yahoo site Explorer it shows more links than it count. MazeCore Monitor is definitely an useful application. If Bing is counting on social networking activities then it will be easier for us to optimize our website on Bing and improve our rankings over it. This is graph is really interesting, it shows critical informations that can help through link building process. Have landed up in this page while looking for difference between yahoo and google backlinks. thanks for the nice article. I have noticed this too. I will have a lot of backlinks coming from Yahoo and not that many from Google. I also noticed I rank better in Yahoo than Google too. Google is really confusing me lately. 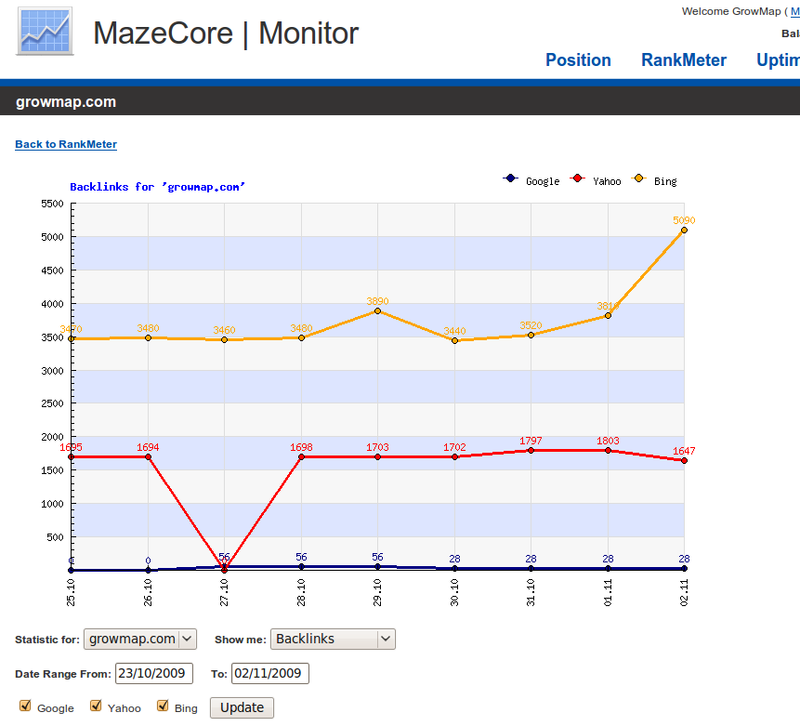 Heads Up: my MazeCore weekly report shows my Yahoo backlinks dropped by 980 !! to 1002. That is quite a drop. Anyone have any ideas why that would happen or whether I should take action? .-= Internet Strategist @GrowMap´s last blog ..How Personal Branding Can Be Made Scalable =-. I use this tool primarily to ensure the most important keyword rankings don’t drop. This is critical for ecommerce sites – or any sites really – that get most of their sales from organic search traffic. Figuring out what works is what SEOs focus on. Those who are serious about learning SEO can Join SEOBook. They have a free membership but the most value is in their subscription site. This sounds like an outstanding tool. I’m always looking for any additional help in optimizing my site for search engine rankings. I’m definitely going to check out MazeCore. The most useful tool I’m using besides MazeCore is the SEOBook Rank Checker which is also part of the SEOBook Toolbar. Use the Rank Checker to generate benchmark reports for your targeted keyword phrases and then plug them into MazeCore to track them visually. We’ll be launching a new dofollow blog related to your Site called PSP Living soon – possibly before Christmas and if not definitely just after the holidays. It already has CommentLuv and KeywordLuv installed. You may want to subscribe there now and Follow PSP Living on Twitter so you’ll know when we publish posts that relate to your site. The search engine results constantly change and they show different results to different Internet users and even change results shown to us if we search on the same thing repeatedly! Yes, they are all experimenting with what Social Networking links to display and for how long. As I mentioned in another reply those types of listings are likely to be short-lived. Thanks for the post. I have a question about search – I always hear about Google and how important it is to follow Webmaster tools and so on. Now that Bing is becoming more popular do they have a set of rules that people should pay attention to in order to improve Bing search ranking? I would think somethings would be different because you don’t get the same search results. .-= Ileane´s last blog ..Top 5 Blog Topics =-. Google is still the gorilla of search; however, it would be good to optimize for the others as well. I have not yet researched how to improve results for any of the others because usually if you write as I advise in Selecting Keywords First and use an SEO optimized Theme like Thesis or a plugin like All-in-one-SEO you will be well indexed almost anywhere. how to get yahoo ,bing or google backlink? Thats very interesting stuff. Itrs amaying how frequently they update their listings…I often see sites in the listing that have been updated just minutes before! .-= Adam @ D Rex Interactive Dinosaur´s last blog ..D Rex Interactive Pet Dino =-. Google has different result sections and is experimenting with how and what they display. The latest focus is on real-time results. Just remember that what gets indexed as real-time (like Twitter) will also be short-lived – those results appear and disappear very quickly. If you want to maximize their benefit take a screen capture and write about it in a post or share them while they’re live. .-= graham@promotional bags´s last blog ..Promotional drawstring bags are this years hot promotional gift =-. You’re correct – they index far more than they display and more links from relevant, quality sites can increase traffic to any blog or business. MazeCore Monitor is great tool and i think its easy to check the links with this tool. Really it is a great tool and thanks for posting this article it really helped me. I’m finding that MazeCore keeps me focused on the search engine positions of the most important keywords for each site I use it on. I highly recommend it as an inexpensive way to keep a business or blog’s traffic growing instead of slipping! That is a really wild niche you’re targeting with your site: Movie News, Reviews, Bollywood, Tollywood, Jobs. Is it working for you? Check out the post featured in CommentLuv for this reply for tips on generating more traffic. Gail I love how you use my site as the example here 🙂 I do not quite know why my site gets indexed so fast. I wish I new more to share. .-= Murray Newlands´s last blog ..Twitter Contest =-. I know why your site gets indexed so fast – it is because you post so frequently. Search engines love fresh content. Glad you noticed that I use real businesses and blogs as examples in my post. I would love to see more bloggers support the businesses and blogs they trust by doing the same. .-= Internet Strategist @GrowMap´s last blog ..Thankful MEME: Who Murray Newlands Thanks =-. thanks fore sharing this useful tool.i appreciate your work.Google shows less links but i think they counts more.day by day they are decreasing the number of back links. Great tool, this article realy help me. Thanks, it really looks promising! Google is likely to continue to be the Gorilla of search unless Internet users start making conscious choices to use other search engines. I recommend DuckDuckGo and Zuula. I especially like Zuula for blog search as it sorts results by relevancy AND recency. The masses are giving Google far too much power and they don’t think enough or care enough to do anything about it. P.S. Do you know we can’t access your site? I get 403 forbidden errors. The same happens with me recently when I check pagerank sites. It’s annoying and slightly confusing. They make it confusing on purpose. Yeah I’ve noticed similar trends in the indexing of many of my sites with google indexing a lot less pages then the other SEs. What each search engine displays and what they’ve actually indexed are worlds apart. They continually change how much of what they’ve crawled is visible to those who search – and every person who searches can be shown different results! All we can do is our best at getting relevant backlinks to quality content. I have also had some serious issues in paying for back links, only to find out that they don’t remain live. That is incredibly frustrating. Google of course is always frustrating, but it is the one that you want to master. I find that I am normally at the top of the Yahoo rankings, and I fluctuate in Google. I suspect that most people who buy backlinks aren’t being choosy enough about what kind of links they’re paying for and the quality of the work. I delete almost all of the spammy comments that are obviously paid backlinks and so will many bloggers. Poor quality comments make really poor backlinks with super-short lives. There are also greedy folk who will give you a link in return for something and then delete it later knowing most people will never know because they aren’t tracking them – or at least not each link. Google is more than frustrating – they are dangerous. Imagine the impact having all your Google traffic disappear overnight would have on your business? Read Why You Can Not Rely Solely on Organic Search Traffic for more details. It is obvious that the search engines and especially Google filter which results they show us and they do in fact show different results to people based on IP address and country. They probably crawl much of the same content; it is what they choose to share that differs. wonderful! MazeCore Monitor really works. I appreciate it that you shared something so useful with the readers of this blog. .-= jim@thinkgeek coupon code´s last blog ..Special offer =-. I am finding the daily MazeCore reports very useful even though I’m only using the free version. I can imagine how valuable it would be to have instant graphic visuals of dozens of your most important keyword phrases. Going to check out MazeCore after this. I have google alerts set up for link checking on competitors but it doesn’t seem to be as good as it once was. I did notice this last update that G is reporting far less links than ever. .-= Charles@Las Vegas Property´s last blog ..First Time Home Buyer Tax Credit Extended =-. Check out the free backlink tool mentioned in the second comment too. That may be the slickest way to keep track on incoming links and also to track commenting activity. Thanks for the great post. Yeah, Google can be frustrating…I generally have my seoquake tool bar running so it shows the links from Google, Yahoo, and bing. As for backlinks, Google is really all over the map while Yahoo seems to be the most reliable in my opinion. I have found that Google is not valuing fresh content as much as it used to. In my industry they are ranking dinosaur sites with no fresh content much higher than other sites who are working hard providing good content. Whether Google favors fresh content or dinosaur sites may vary by search OR it could be that the fresh content I see doesn’t have any strong competition from old sites. My recent posts about gift affiliate programs here and in Murray Newlands affiliate related blog both ended up on the first page the same day. I must say that I don’t fully understand this thing with backlinks and stuff but I’m just an old man that is not very advanced in computers. But until now i managed to use some interesting options. The first thing you may want to learn is how to use KeywordLuv to select your own anchor text. If you want to get more visibility for your site you could target phrases like “Miami motorcycle” or “motorcycle rentals” “florida motorcycles” or “American Rider” when you leave comments in KeywordLuv blogs. See our DoFollow Tools and Lists for more details on that. We’ve just started using the backlink tool recommended in the second comment in this post to track the effectiveness of our comment links. I would also recommend getting your business listed in Local Search directories. See the post linked to this comment and the Local Search and Special Offer tabs at the top of the page for more details on why that is important. Google has always been known to show the lowest number of links. We generally use Yahoo’s data for backlink analysis. Google is also placing some emphasis on first link priority – giving more weight to the first link of the page. It is something to look out for over the next few weeks. .-= Greg Rollett´s last blog ..Whatcha’ Think I Blog For, To Push a Ford Contour =-. Welcome Greg and thank you for the great tip about weighting. I’ll be sure to pay attention to what I link to first. Thank you for sharing. This is a great tool, not just to track your sites backlink but also take a look at your competitors to see if they are growing at the same rate, better or slower than them. Have not looked at the software yet, but I would assume you can just type in any url. Thanks for the share. Cheers. Also, it is a known fact that google always reports less backlinks compared to yahoo and bing. Webmaster tool typically shows more, however again fails to show all of your backlinks. Not sure why they fail to share the results with the users. The free version of this tool won’t let you but if you have the paid version you can track your competitors too. The fees are posted at MazeCore cost. If anyone knows of other similiar tools please share them. There are many that will display the information but MazeCore is the only one I’m using that emails it to me so I can compare it over time and charts changes over time. Google was always show just few backlinks, but I think they are calculating much more links. Google has changed its algorithm … Due to it the results may look pretty weird…. Yes, they change it all the time. I see your site is Holidays in Venice. Is Gorizia a city in Italy? I think it is just G trying to make it harder and harder for people to figure out what they doing with their algos. The less data they show, the harder it is to “reverse engineer” the thing. .-= Jim Michels@ Indianapolis Painters´s last blog ..post1 =-. You’re probably right. I see you have a business blog and you’re checked out on using KeywordLuv. That is great. Check out the post we did on Selecting Keywords to get the best search engine placement for your blog posts and pages. I reckon it could be a couple of things. 1. Google has just gotten slack. 2. They don’t pay or give the Googlebots enough incentive and so they’re only doing half their job. Good to see you here again, Sire. Google has obviously been reducing the number of links they index – at least VISIBLY (meaning they probably have them but don’t display them). SEOs have used Yahoo instead of Google for link tracking for a long time. Hopefully the Bing results may be indicating an improvement in tracking links related to Social Networking. Oh, did you see my recent Best of GrowMap post? I’ll feature it in this comment. Thanks for the post; I’ll be sure to check out MazeCore. I’m always looking for good tools to help with SEO. One thing that I’ve found frustrating is exchanging or paying for backlinks only to find that the link is no longer live weeks or months later. I created a free tool (only requires a link for continued use) that automatically tracks the status of your backlinks. It also tracks the PR of the linking page, amount paid, anchor text, and more. You can check it out at http://www.backlinkreporter.com. I’d love to hear some feedback on the tool. While we have never paid for links we get (and mostly delete) tons of links businesses are obviously paying someone to submit. We just signed up for and linked to your tool and will test is out. It could come in handy for tracking comments left in blogs so we’ll be testing it for that use first. We’ve been looking for a better way to do that so thank you. If it works as well as I hope it will I’ll write about it in a future post. Could we interest you in creating a very similar free tool for tracking blog comments. Instead of the money columns we need columns for DF, CL, KL and PR. (Dofollow, CommentLuv, KeywordLuv, PageRank). MazeCore Monitor is awesome and i think its wonderful to check the links. Yes, I am finding their information very useful. Having the paid version would make monitoring positions on your most important keyword phrases much faster and easier.